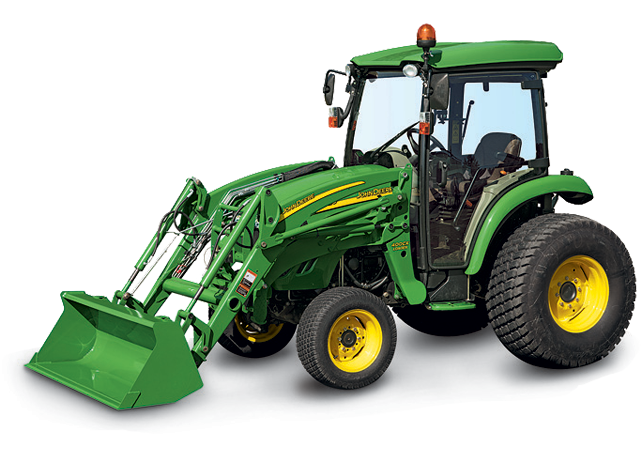 John Deere is one of the largest manufacturers of agricultural machinery, construction machinery, forestry machinery, diesel engines, drivetrains and lawn care equipment worldwide. The US-american group Deere & Company uses John Deere as its official brand name and is a publicly traded company on the New York Stock Exchange. 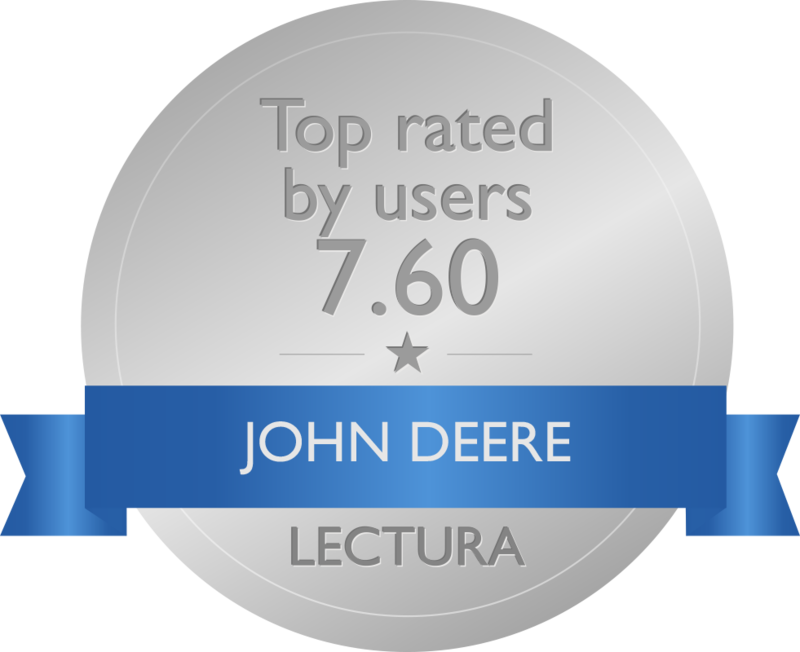 John Deere has over 67.000 employees worldwide and is the largest agricultural machinery manufacturer in the world. 2018 markes Deere & Company’s 100th anniversary by celebrating the launch of the first ever John Deere tractor, the Waterloo Boy, which was a result of the acquisition of the Waterloo Gasoline Company in 1918. John Deere is one of the oldest corporations in the United States of America and is maintaining John Deere manufacturing plants all over the world. Deere & Company is distributing its products and machines in over 160 countries by selling through a dealer network with more than 500.000 dealers worldwide. In 2017 the company announced the acquisition of Blue River Technology, one of the leading providers of machine learning solutions and tools for agricultural and forestry machinery, as well als the take over of the german based company Wirtgen Group, which is the number one manufacturer of road construction equipment. With this acquisition, Deere & Company is able to indefinitely enter the global construction machine market, apart from the John Deere brand’s own construction machines such as the the John Deere 944K hybrid wheel loader or the John Deere 950K lange dozer. John Deere 4WD tractors are known for their signature design and loved by the machine operators for their high horsepower John Deere engines. According to John Deere, the 4WD tractors were invented out of pure desperation to find a tractor with the highest working power. Deere & Company ensured this by reducing the engine size, increasing the wheel and tire size which added traction. John Deere 4ED tractors have an average working weight of 11 tons and can reach up to 900 hp today. The first ever John Deere four-wheel-drive tractor was introduced in 1959 in Iowa. The John Deere 8010 could reach a total horsepower of 215 and was only built a total of 100 times. In 1968 the John Deere 4WD product portfolio was expanded with seven new models hitting the market at once. The 820, 920, 1520, 2520, 4000, 4520, WA-14, and WA-17 – with the WA-14 and the WA-17 being articulated 4WD tractors. The next generation of John Deere four-wheel-drive tractors was introduced in 1974 with the John Deere 8430 and 8630, followed seven years later by the 8450, the 8650 with 290 hp and the strongest 4WD tractor 8850 with 370 hp. Today one of the most important John Deere tractors are 4WD tractors which can also be acquired with tracks. John Deere combine harvesters range amongst the most sold machines on the market. The US-American group Deere & Company started manufacturing these agricultural machineries in the early 1920s. The first John Deere combine harvesters were still tractor pulled attachments which were equipped with an extra engine to ensure a maximum working strength for the farmer. All original John Deere combine harvesters were horse-drawn or tractor pulled. John Deere introduced the Hillside Technology in the 1930s, which ensured that hillside fields could be easily harvested as well. The modern combine harvester by John Deere is designed to harvest various different kinds of crops by reaping the crop, threshing it and winnowing the harvested fruit. Today John Deere combine harvesters are not just a machine. They are equipped with high quality i-solution, which ensure the highest efficiency while harvesting the crop. These kinds of technologies like the ProDrive transmission or the high resolution CommandCenter display. 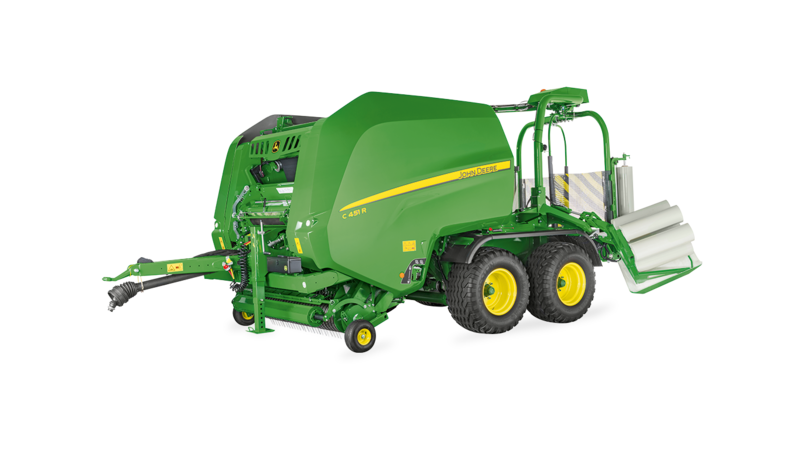 Deere & Company has a total of 5 models, with 4 different separator concepts in its combine harvester product portfolio. As the name would suggest John Deere compact utility tractors represent a much smaller and compact version of the original full size John Deere tractors - John Deere Utility or Agricultural Tractors. The John Deere compact utility tractors are designed principally for landscaping, digging, snow and ice removal and other tasks within the domestic property maintenance segment. The John Deere utility tractors are designed to handle and be equipped with a variety of different attachments such as a John Deere front-end loader, John Deere box blade, John Deere grader blade, John Deere post hole digger, John Deere rotary tiller and many other accessory equipments. Today modern compact utility tractors are featured with a rollover protection mechanism to ensure the safety of the machine operator. In 2016 the US-American manufacturer expanded its 3E Compact Utility Tractor Series with the introduction of the 3025E John Deere Compact Utility Tractor. The machine is equipped with a 25 horsepower John Deere engine and completes the line of compact utility tractors with being the third machine in that line. The John Deere 3E Series has a total range up to 38 horsepower machines. Other Series within the John Deere Compact Utility Tractor segment is the 1 Series which according to the manufacturer represents the ideal machine for mowing, loading, tillage and many other low maintenance jobs. The next bigger range is the John Deere Compact Utility Tractor Series 2 which are compact but more efficient compact tractors. Last but not least the Series 4 John Deere Compact Utility Tractor range represents the John Deere 4M and 4R Series, equipped with an up to 65 horsepower John Deere diesel engine. 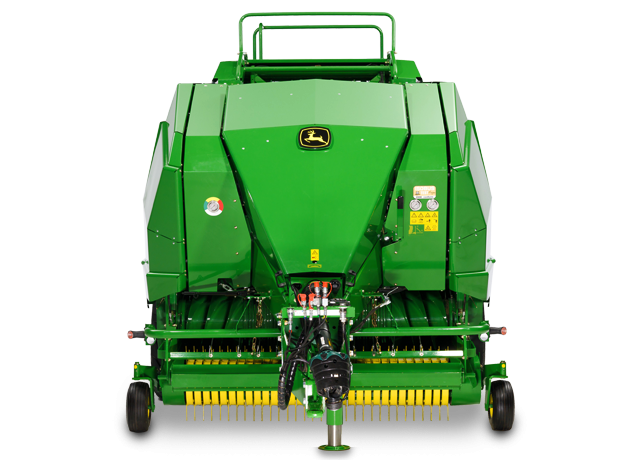 The John Deere Baler range is part of the manufacturers hay equipment range. The John Deere Round Balers are being manufactured at the John Deere plant in Ottumwa, Iowa along with John Deere rotary mower conditioners, self-propelled windrowers, pull-type forage harvesters as well as small square balers. A baler is a piece of farm machinery used to compress cut crop into compact bales. John Deere first started industrially manufacturing these machines in the 20th century and up until today the machines are in high demand all over the world. Today John Deere differentiates between Variable Chamber Balers, Fixed Chamber Balers, Large Square Balers and Wrapping Balers. John Deere Variable Chamber Balers are equipped with a formation chamber featuring flat belts and a belt tensioner. Those applications work together to ensure that the product has a uniform density from the center out. John Deere uses the HiFlow technology within its Variable Chamber Balers for a high baling capacity. Fixed Chamber Balers operate in a different way. The crop is gathered into the baler chamber and after that dynamic drive rollers spin it in an anti-clockwise direction. Additional rollers subsequently form the bale before it is wrapped and discharged from the chamber. The John Deere 900 Series Variable Chamber Baler Wrapper is the newest addition to the John Deere Baler range. The machines can produce and wrap bales simultaneously. A baler is a piece of farm machinery used to compress cut crop into squares. John Deere first started industrially manufacturing these machines in the 20th century and up until today the machines are in high demand all over the world. Square Baler Equipment like the John Deere L341 Large Square Baler is equipped with the John Deere MegaWide pickup for square shaped bales, the John Deere moisture sensor, an optional Premium MegaWide pickup, John Deere BalerAssist drivetrain system for hydraulic back out plugs with remote control and the Bale Mobile App. John Deere Wrapping Balers are machines that are being manufactured in association with the Austrian company Göweil, which is a specialist manufacturer of wrapping bale systems. John Deere’s newest series of square balers is called the 1400/L1500 Series and it consists of John Deere 1424, the L1524 and 2 other models. The bale dimensions of John Deere 1424 large square baler are 120 x 70 cm, it has 6 knotters and a high capacity rotor. The 1424 square baler demands 98 kW of power for take-off and weighs 8,8 tons. Since starting production in the US in the early 1930s John Deere has been a manufacturer and supplier of trailed field sprayers all over the world. The machines are build to help farmers distribute nutrients evenly and efficiently all over their crops. Ever since launching the first Deere & Company field sprayer 80 years ago the technology within the machines has been evolving every year. In the 1930s John Deere launched three different row-crop sprayers, which were equipped with the John Deere Novo engine drive, tractor drive and traction drive. They had a 150 gallon cypress tank and the at that time exclusive to John Deere angle iron boom. 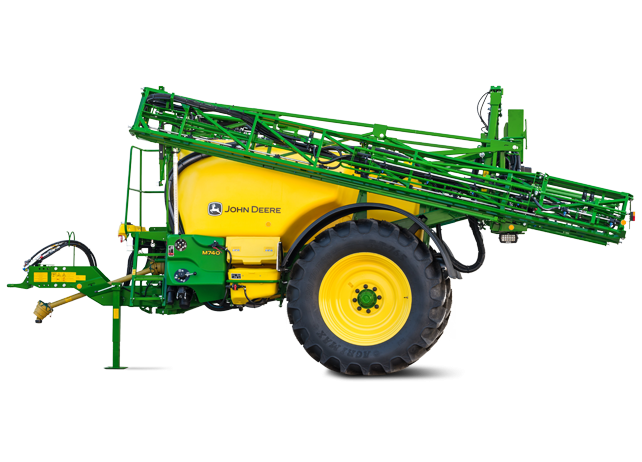 Fast forward to 2004 the first ever 1200-Gallon self propelled sprayer was launched in Columbus, Ohio. The machine is a high capacity sprayer was equipped with John Deere's’ first 120 foot boom. In 2008 John Deere launched the John Deere 4730 and John Deere 4830 Sprayers, with 245, respectively 275 horsepower engines and 1000-gallon solution tanks. In 2013 the John Deere Series 4 Sprayers were introduced with the John Deere R4030 and John Deere R4038 Sprayers. According to the manufacturer these machines were built to ensure maximum productivity for the farmers due to increased field and transport speeds and a dry spinner spreader compatibility. As a replacement of the John Deere 4940 Sprayer, Deere & Company launched the R4045 Sprayer with a 1200-gallon tank and a 346 horsepower engine. This sprayer is also equipped with John Deere LoadCommand and the John Deere Target Fill. In 2015 the manufacturer also updated the former 4630 self-propelled sprayer with the new R4023, 173 horsepower PowerTech PSS 4,5 l Tier 4 diesel engine and a 600 gallon sprayer tank. The machine is equipped with John Deere precision ag technologies and a 90-foot boom added in 2016. The year 2016 marked the year where John Deere introduced a whole range of guidance productus for the John Deere field sprayers, such as the AutoTrac Vision and AutoTrac RowSense technology. These systems ensure that the machine can at all times detect the location of the crop in order to precisely keep the machine between the crop rows. The John Deere high Capacity Nutrient Applicator F4365 was launched in 2016 and is a 365 horsepower machine with a 330 cubic feet dry spinner spreader capacity. Another addition to the precision ag John Deere family is the John Deere ExactApply nozzle, with a high frequency 30 Hz PWM spray nozzle control. John Deere offers a total of 14 models within its 4WD 9R/9RT/9RX tractor line. The four-wheel-drive tractors are large-horsepower agricultural machines and are available in various different shapes and sizes. The customer can choose between a 2-track-solution or a 4-track-solution, which can be divided into wide and narrow tracks. The John Deere 4WD tractors are available between 370 hp and 620 hp. The model with the smallest engine is the 9370 R wheel tractor with 370 hp, followed by the 9420 R John Deere wheeled tractor with 420 hp, the 9470 R with 470 hp. In the power segment between 520 and 620, John Deere offers the 9520 R, the 9570 R and the 9620 R. The two-track-line of the Series 9 John Deere tractors is labeled with RT. The 9470 RT, 9520 RT and 9570 RT are standard 2-track-tractors. In addition to the existing models Deere & Company decided to launch tractors that can be chosen with either narrow or wide tracks. The 9420RX is available only with narrow tracks while the 9470RX and the 9520RX are being offered as “Wide or Narrow“-tracks tractors. The 9570RX and the 9620RX are the only John Deere tractors that were introduced while only offering the John Deere 4-track-system. The John Deere 8R Series of row crop tractors range from 245 horsepower diesel engines to 370 horsepower John Deere diesel engines. The 8RT range is equipped 320 to 370 horsepower diesel engines and offers the additional option to add 35 horsepower by using the John Deere Intelligent Power Management. All 8R/8RT models are equipped with a Tier 4 Final compliant 9,0 l John Deere PowerTech PSS engine. This diesel engine can provide up to 370 horsepower. The John Deere Row Crop Tractors Models include the 8245R, 8270R, 8295R, 8320R, 8345R, 8370R, 8320RT, 8345RT and 8370RT. The John Deere 8245R, 8270R, 8295R and 8320R are all available with 16-speed PowerShift, AutoPowr IVT as well as e23™ transmission. The 8345R, 8370R, 8320RT, 8345RT and 8370RT are only available with AutoPowr IVT and e23™John Deere transmissions. All 8R/8RT tractors feature a John Deere CommandView III Cab which is a further developed version of the John Deere CommandView II cab. The cab offers 40 degrees of seat swivel to the right and is equipped with the John Deere CommandARM and John Deere CommandCenter. Optional features include a refrigerator and heated leather seats. Today John Deere combine harvesters are not just machines. They are equipped with high quality i-solution, which ensure the highest efficiency while harvesting the crop. These kinds of technologies like the ProDrive transmission or the high resolution CommandCenter display. 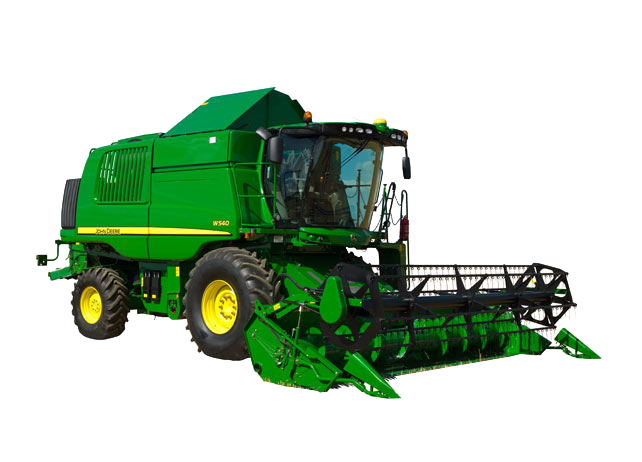 Deere & Company has a total of 5 models, with 4 different separator concepts in its combine harvester product portfolio. Starting with the CWS-Series 2 Combines, with the most recognizable machines, the John Deere 1450 Series 2 and the John Deere 1550 Series 2. The next in line are the W-Series Combines, designed for areas with high yields and equipped with the John Deere HillMaster, the W540, W540i, W550, W550i, W650, W650i, W660, W660i belong to this model range. The John Deere T-Series Combines offer a unique machine operator experience and are also available with John Deeres i-Series package with productivity enhancing features. The John Deere T550, T550i, T560, T560i, T660, T660i, T670, T670i belong to the T-Series of John Deere combine harvesters. John Deere C-Series Combines represent the companies hybrid combine harvesters available with the i-Series package are represented by the John Deere C670 and C670i. The latest series of John Deere Combine Harvesters is the John Deere S-Series, which was first introduced in 2017. The machine is equipped with John Deeres’ rotary combine technology, a high separator capacity and the highest grain quality. The John Deere S690i is offered in a standard package with the John Deere i-Series productivity enhancing package. The John Deere 4 Family of Compact Utility Tractors features the 4M and 4R model ranges of John Deere Compact Utility Tractors. 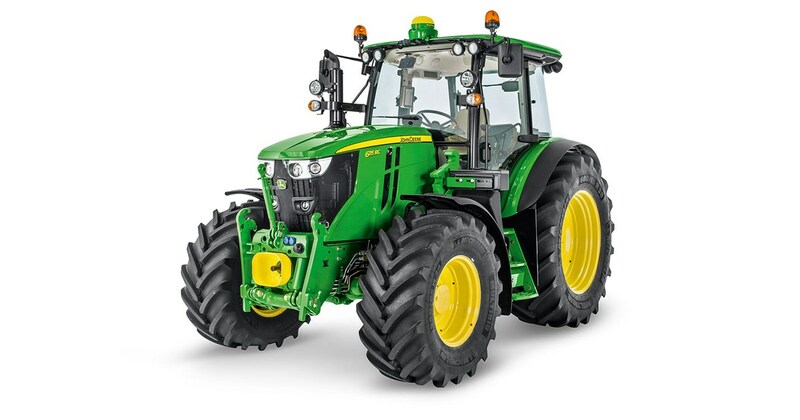 The 4M range features the John Deere 4044M, with a 43.1 horsepower John Deere engine, 4 wheel drive and an open station while being equipped with a John Deere Hydrostatic – 3F/3R or PowrReverser™ 12F/12R transmission. The next bigger machine is the within the 4M range is the 4052M Compact Utility Tractor with a 51,5 horsepower John Deere diesel engine, Hydrostatic – 3 Range or PowrReverser™ 12F/12R transmission, 4 wheel drive and an open station. The machine with the most horsepower in this range is the 4066M Compact Utility Tractor with a 65.9 horsepower John Deere diesel engine, 4 wheel drive and Hydrostatic – 3F/3R or PowrReverser™ 12F/12R transmission. This machine, along with all 4M John Deere Compact Utility Tractors is only available with an open station while the 4R range offers the option to feature the utility tractor with a closed John Deere cab. The 4R range starts with the 4044R Compact Utility Tractor with 43,1 horsepower John Deere diesel engine and is followed by the 4052R which offers 51,5 horsepower. The largest machine is identical to the 4M range the John Deere 4066R Compact Utility Tractor with a 65,9 horsepower John Deere diesel engine. All 4R Machines are equipped with 4 wheel drive and Hydrostatic – 3F/3R or PowrReverser™ 12F/12R transmission. The F400 series of fixed chamber round balers features 4 models: F440E, F450E, F441R and F441M. John Deere F440E and F450E balers are optimal for daily and regular use as they are designed to be simple and cost efficient, but also robust and compact. John Deere F440E and F450E baler provide the best performance in dry crop (straw and hay baling), thus being ideal for small-farm operators. The bale diameter of the F440E is 1,2 metres, while the bale diameter of the F450E equals 1,5 metres. The standard pickup of both machines is 1,5 metres, however, there is an option of 1,9 m pickup for heavier windrows. John Deere F441R fixed chamber round baler is built for high volume silage baling and it is suitable for all kinds of crop. The F441R is a round baler with top performance in a heavy-duty design with pickup of 2,2 metres (or 2 m). Its rotor can be equipped with 13 or 25 knife cutting versions. The bale diameter (1,25 to 1,35 m) and density can be easily set up from the cab via the ISOBUS connection technology. John Deere F441R fixed chamber round baler offers wide range of tires, to mach the operator’s needs and fit the weather/field/road conditions. John Deere F441M round baler is a multicrop performer suitable for low volume applications. Customers can also choose between MultiCrop and Silage Special modifications of chambers. The adjustable bale diameter of John Deere F441M round baler scales from 1,25 to 1,35 m and the available pickup widths are 2 and 2,2 m. John Deere F441M baler can be equipped with RotorFlow HC Premium (multicrop feeder) or with MaxiCut HC Premium attachments (available with 13 or 25 knives). The John Deere V400 series consists of 5 variable round chamber balers: V451G, V451R, V451M, V461M and V461R. The “V” prefix stays for versatility – hay, straw, haylage or silage, John Deere V400 series balers are suitable for baling of all kinds of crop, no matter the volume. All models are equipped with a high capacity rotor featuring 480 mm diameter converging auger. John Deere V451G round chamber baler is engineered to be simple, economical and robust, simply optimal for regular use. John Deere V451G baler performs best with dry crops such as hay and straw, providing pickup of 2,2 metres. The adjustable bale diameter ranges up to 1,65 m in a 1,21 m bale chamber width. John Deere V451M and V461M round chamber balers are designed for fast multi-crop baling. Both models offer 2,2 m wide pickup, wide choice of rotors, LED lights for night working and ISOBUS compatible monitors. The adjustable bale diameter of John Deere V451M scales from 1 to 1,65 metres, whereas the bale diameter of V461M ranges 1 from 1,85 metres. John Deere V451R and V461R are the V400 series premium models as they offer high volume, quality and features such as Fast Release System, leading to production of more than 120 bales per hour (this is John Deere’s fastest release system ever built) or ISOBUS displays. Both V451R and V461R round balers offer 2,2 m wide pickup and hands-free unplugging with full width hydraulic drop-floor. The operator’s of John Deere V451R and V461R balers have a choice between three high capacity non-cutting and cuting rotors. The V451R and V461R balers come with Tractor Baler Automation, which allows monitoring, regulating and coordinating baler functions straight from a tractor via the ISOBUS connection. John Deere round balers C441R, C451R and C461R are actually wrapping chamber balers. The C441R wrapping baler is based on the F441R fixed chamber baler, combined with the John Deere Transport Table System, keeping short and compact format together with modern design. John Deere C441R wrapping round baler is available with single or tandem axle and it is able to standardly produce around 80 bales per hour (up to 92 bales/h), being suitable for all kinds of crops. The feeders of the C441R baler are 2,2 m wide and they provide pick up width of 2 m. The adjustable bale diameter ranges from 1,25 to 1,35 m. John Deere C441R wrapping round baler can be equipped with 13 (Maxicut HC 13) or 25 (Maxicut HC 25) knives. John Deere C451R and C461R round balers combine the V451R and V461R solo balers with the John Deere Transport Table System; therefore, achieving the status of a wrapping baler. The pickup width of both C451R and C461R round balers is 2,2 metres and they can be equipped with 13 (Maxicut HC 13) or 25 (Maxicut HC 25) knives. The bale diameter of John Deere C451R ranges between 0,8 and 1,6 metres, whereas the bale diameter of the C461R baler ranges from 0,8 to 1,85 metres. John Deere's L1500 series includes the L1524, L1533 and L1534 models. They all have a large press channel and high-performance plunger. Bales can be pressed with a cross section of 70x120 (L1524), 90x80 (L1533) and 90x120 (L1534). The maximum bale length for all three models is 3 meters. The pickup width of the L1500 series pickup is 230cm. The pickup diameter is 34cm. Furthermore, all three models have 5 tine rows with 61mm tine spacing. The two models L1524 and L1534 are equipped with 23 knives. The L1533, however, has only 15 knives. In addition, the L1533 is equipped with 4 double knots. The two models L 1524 and L1534 have 6 double knots. According to John Deere, the L1500 series is designed for ease of maintenance. Daily maintenance work should be carried out easily. For example, piston, yarn guide and needles can be easily reached. In addition, the L1500 series balers have maintenance platforms mounted on both sides of the machines. They facilitate regular maintenance and ensure a pleasant working area when inspecting the knotter area. To give users longer working hours, the L1500 series balers have been equipped with two powerful LEDs. These are attached to the rear of the machine and offer optimum illumination of the shaft and the press, according to John Deere. John Deere M700 | M700i series consist of 5 models of trailed field sprayers (M724, M732, M740, M740i and M732i), which are, according to John Deere, suitable for cropping as they offer broad range of farming options. They crop protection is achieved due to wide configuration possibility, which leads to multiple solutions. One good example is the GPS section control system, reducing skips and overlaps, turning boom sections on and off automatically. Those smart solutions subsequently provide more productive and cost efficient spraying. The M724, M732 and M740 trailed field sprayers are equipped with sprayer control with multi functional level (joystick), whereas the M732i and M740i models are ÏSOBUS ready. The ISOBUS system uses basically one display to control the entire fleet of implements. John Deere M724, M732 and other M700/M700i series trailed field sprayers feature slim design and durable fixed or steering drawbar for accurate tracking and their pump capacity is 280l/min. John Deere M700/M700i trailed field sprayers go through minimized bouncing as the spray booms are cradled during the transport, thus providing uptime. John Deere M724 trailed sprayer offers tank capacity of 2400 litres and rinse tank capacity of 400 litres. The boom width of John Deere M724 with double folded booms is 18 - 28 metres (24 - 30 metres for triple folded booms) and the boom height range is 224 cm. John Deere M732 and M732i trailed sprayers offer even bigger tank capacity than the M724 model — 3200 litres. The rinse tank capacity is the same for all the models in these series — 400 litres. The largest tank capacity of 4000 l is provided by John Deere M740 and M740i trailed field sprayers. The M700i series models (M732i and M740i) also offer AutoDilute cleaning and rinsing, LED lights for night time productivity, BoomTrac automation - spray boom levelling and height and John Deere i-Solutions - automatic gathering of the workflow data (crop production processes, traceability), which can be later used for detailed productivity and performance analysis. John Deere M900 | M900i series of trailed field sprayers are made up of 6 models. There are three models in each series: M944, M952, M962 (M900 series) and M944i, M952i, M962i (M900i series). According to John Deere, these trailed field sprayers bring wide range of options and they can be easily configured in order to meet the operator’s requirements. John Deere trailed sprayers M900 | M900i series are based on successful R900i series, being equipped with the same large tank cradled in the same robust chassis, thus providing enhanced operational stability. Moreover, all adjustments and manual controls are optimised for any kind of operation and they can be more easily serviced and maintained. John Deere M944 and M944i trailed field sprayers offer tank capacity of 4400 litres, whereas the M952 and the M952i models offer 5200 litres of tank capacity. The largest capacities of 6200 litres are provided by John Deere M962 and M962i trailed field sprayers. All 6 models share the same rinse tank capacity of 620 l and their pump capacity is 2x 280 l/min (max. 250 l/min to boom). The boom width (double-folded booms) ranges between 24 and 28 metres (24 - 40 m for triple-folded booms) and the boom height range is 200 cm. John Deere M944, M952 and M962 trailed field sprayers can be optionally equipped with automatic tank filling system, whereas the M944i, M952i and M962i models can be optionally enhanced with BoomTrac tilt and height control with headland management. Moreover, the M900i series models offer John Deere i-Solutions system - automatic gathering of the workflow data for better performance and productivity. The R900i series includes the field sprayers R944i, R952i and R962i. These are pulled field sprayers. The smallest model, the R944i, has a brewing tank with a capacity of 4,400 liters. The two larger models are equipped with brewing containers with 5,200 l and 6,200 l capacity, respectively. The clear water tank holds 620 l in all three models. According to John Deere, the R900i series can increase product productivity while reducing costs. With the multi-function lever mounted in the cab, the driver can determine the height of the boom individually. When working with the Boom Height Assist and the BoomTracTM, the driver adjusts the correct height before the start and the automatic takes over the height guidance. In this way, the ideal boom height is always taken care of. The John Deere BoomGuard minimizes pitching, rolling and yawing movements as well as vertical and horizontal movements, allowing the R900i sprayers to optimally distribute the spray. For the durability that is expected of a professional trailer sprayer, is provided with a massive frame with X-structure. For greater comfort and stability, the ProRoad suspension is fitted as standard in all models. With the aid of various technical solutions, such as the tank filling calculator or the SprayerProTM for automatic section control, costs can be saved and accuracy increased. In addition, the driver can comfortably monitor all information in the cab. The R944i, R952i and R962i also look good on the road. The field sprayers convince according to John Deere with a good stability and high maneuverability.